The film Outlaw King begins with a vivid depiction of the siege of Stirling Castle in 1304, a key event in the First Scottish War of Independence. A huge trebuchet is shown throwing a flaming projectile over the walls to smash the defenders into submission. The film uses the surrender of the castle as a starting point to illustrate the nadir in Scottish fortunes, when the kingdom was on its knees. Subsequently the situation slowly recovers as Robert Bruce rebels against the English and gradually gains the upper hand against them. I was really pleased that the film makers chose to begin their film with this siege as it is one of my favourite episodes from this conflict, in part due to the striking setting of Stirling Castle. A wealth of narrative and financial sources also means that the siege can be reconstructed in detail. However before we get onto the event itself, it is worth relating the circumstances which led to the siege. Ultimately it stemmed from a crisis within the Scottish royal family. The line of succession was thrown into turmoil due to the unexpected death of Alexander III, King of Scots, who was accidentally killed whilst travelling to see his wife, Yolande, on the night of 19 March 1286. This left his three year old granddaughter, Margaret, the product of a union between Alexander’s now deceased daughter, also called Margaret, and King Eric II of Norway, as his closest living relative. Ambassadors were sent to negotiate with King Eric for Margaret to be sent to Scotland to take up the throne, with the governance of the kingdom entrusted to a group of six men, known as the Guardians, by the Scottish nobility and prelates. The Guardians also sent embassies to Edward I of England to seek his advice and support during this period of crisis. At the time this would have appeared to have been an entirely sensible course of action to take as Anglo-Scottish relations had been positive for years and Edward was an internationally respected ruler. There were firm links between the two royal families, with Alexander having been married to Edward’s sister (also called Margaret who died in 1275), and many English and Scottish nobles held land either side of the border. Eventually it was decided that the issue would be resolved by a marriage between Margaret and Edward of Caernarfon, the son and heir of Edward I. This union, if it had taken place, would have united the crowns of England and Scotland (instead it took a further three hundred years for this union to occur). Margaret’s sudden death in the autumn of 1290, soon after her ship reached the Orkneys, thwarted this scheme. Her demise left Scotland on the brink of civil war with thirteen potential candidates vying for the throne. Edward quickly took charge of the situation by summoning the Scottish nobility to appear at Norham, on the Anglo-Scottish border, in May 1291. Hearings then took place at Berwick-upon-Tweed in August, to determine who had the best claim to the throne, with Edward acting as arbitrator. He used this position to pressure the candidates into accepting his claim to overlordship over Scotland (a longstanding English claim based on mythology and past historical events). Eventually Edward decided in favour of John Balliol, Lord of Galloway, who was inaugurated on 17 November 1292 as King of Scots and who took possession of the kingdom. Yet Anglo-Scottish relations deteriorated soon afterwards, primarily due to Edward’s attempts to excessively exploit his rights as feudal overlord, such as by hearing appeals from John’s subjects, which undermined the latter’s authority as king. These actions revealed a dark side to Edward’s character. The English king was highly regarded for his martial prowess, through his victories in the civil war in England (notably at the Battle of Evesham in 1265) and the conquest of Wales. Yet he had also developed a reputation for treachery and inconsistency, which became evident in his dealings with Scotland. The final provocation was the demand that King John and eighteen Scottish nobles should provide military service in person for an expedition to France in 1294. This move provoked the Scots into seeking French assistance, with an alliance concluded in October 1295, subsequently known as the ‘Auld Alliance’. Edward’s response was to prepare for war with Scotland by issuing orders for an army to assemble at Newcastle-upon-Tyne. The Scots pre-empted the invasion in early 1296 by raiding across the border and laying siege to Wark Castle and Carlisle, but were unable to capture either place, prompting them to withdraw northwards rather than risking a direct confrontation with Edward’s army. This left southern Scotland vulnerable to attack, with Berwick-upon-Tweed stormed by the English on 30 March. In the following month, a Scottish attempt to relieve the besieged garrison of Dunbar Castle led to a clash between the cavalry of both sides, with the Scots routed. This defeat and the capture of many prisoners of high rank after the fall of the castle, led to a collapse in Scottish morale. The invaders therefore faced little opposition as they marched throughout Scotland, with many strong castles, including Edinburgh, surrendered without any resistance being offered. King John capitulated in July and was forced to abdicate in a degrading ceremony before being sent into captivity at the Tower of London. Rather than replace the deposed monarch, Edward instead decided to demote Scotland from the status of a kingdom to that of a land administered by his officials. The apparent ease of their ruler’s conquest was eagerly praised by English chroniclers, with Pierre de Langtoft claiming that his successes eclipsed even those of King Arthur in uniting all of Britain under his rule. Edward soon moved on to prepare for war with France, but trouble was brewing in occupied Scotland. A major uprising broke out in May 1297, following the murder of William Heselrig, the sheriff of Lanark, by William Wallace. English measures to counter the rebellion at first seemed to be successful. A Scottish force led by members of the nobility including Robert Bruce, lord of Annandale (the future Robert I) submitted themselves to Edward’s authority after negotiations at Irvine on 9 June (although Robert was quick to repudiate this agreement!). However, only a few months later a Scottish army led by Wallace and Andrew Murray decisively defeated an English army at the Battle of Stirling Bridge on 11 September. Following this victory, Wallace led a raid across the border into northern England causing widespread devastation throughout Northumberland and Cumberland. A short time later he was knighted and elected as guardian of the kingdom in recognition of his military achievements. These successes prompted Edward to raise a huge army to crush the rebellion in Scotland in the following year. On 22 July 1298, he defeated a Scottish army led by Wallace at the Battle of Falkirk, with the Scots suffering heavy casualties. However, Edward was unable to immediately exploit this victory due to a lack of supplies and was soon forced to withdraw across the border. Domestic concerns in England meant that he was not to return to Scotland for a further two years and in the interim the Scots were able to recover many English-held castles. In 1300, Edward led another army north of the border and succeeded in capturing Caerlaverock Castle after a siege. Over the next few years he spent much of his time campaigning in Scotland with the principal castles of the kingdom systematically besieged and captured: Bothwell Castle fell in 1301, Turnberry Castle in 1302 and Brechin Castle in 1303. By the beginning of 1304, Edward had all but succeeded in quelling all resistance, with most of the Scottish nobility, including Robert Bruce (who had fought against the English from 1298 to 1302), having submitted themselves to his authority. This left Stirling Castle as the last major centre of resistance. Stirling’s location at the lowest bridging point of the River Forth meant that it was of vital strategic importance as it was the entrance point to the Highlands. In some medieval maps it was shown in exaggerated form as a bridge dividing the south and north of Scotland. It was therefore essential for Edward to gain control of the castle. Yet its strong natural defences meant that this would be a difficult endeavour. The castle is situated on the top of a high volcanic outcrop and is enclosed on three sides by the cliffs. It had been a major royal castle since the twelfth century and was encircled by strong masonry fortifications. Stirling was left abandoned to the English in 1296, who garrisoned it and improved its defences, but was recovered by the Scots four years later. In 1304 the garrison of the castle was commanded by Sir William Oliphant, a member of a prominent family in Perthshire. Oliphant had been captured by the English at the Battle of Dunbar but was released in return for taking part in Edward’s expedition to France. Following his return to Scotland he once again took up arms against the English and was appointed constable of Stirling Castle by Sir John Soulis, Guardian of Scotland, in 1300. Despite having little realistic hope of outside assistance, the defenders were determined to resist the English. They could rely upon the strong defences of the fortress and were well equipped with armaments, including siege weapons. According to the author of the Flowers of History (an English chronicle) they consisted of a force of 120 ‘gallant men, whom despair rendered braver’. Nevertheless, the odds were stacked firmly against them due to the sheer scale of the resources available to the English king. For his 1303 campaign, Edward had recruited 9,500 footmen from northern England. This number was substantially smaller by the spring of the following year, with only around 1,000 infantrymen remaining, due to losses from deaths and desertions. Nevertheless, this was a more manageable number of men to supply during a long siege. In addition to this, there was a mounted force of five hundred knights and men-at-arms, together with a large contingent of craftsmen, including carpenters, masons and labourers, supplied by a transport fleet of fifty small vessels. The besiegers were also generously supplied with military equipment. Large quantities of munitions and provisions were procured for the siege, which included crossbows, quarrels, longbows, arrows, pickaxes, ropes, mallets, shovels, livestock and grain. An impressive artillery train of stone throwing siege weapons, known as trebuchets, was assembled by one of the king’s engineers called Reginald. These were highly prized weapons of war due to their ability to propel large stone projectiles over a long distance, which could cause major damage to fortifications. Many of the trebuchets were given their own individual nicknames, with some named after magnates serving in the English army such as Gloucester, Lincoln and Segrave, but others had more unusual names including the Vicar and The Parson. Ammunition for the trebuchets was provided by masons working in nearby quarries, who carved round projectiles out of blocks of stone. Large wooden frames called mantlets were also created by woodman working in Stirling Forest to provide some cover from missile weapons. These preparations meant that the English were well equipped to undertake the task of besieging the castle, despite its formidable defences. The scale of the endeavour also allowed Edward to demonstrate the might and technological superiority of his forces over the Scots. It was for this reason that a viewing gallery was built in the town of Stirling so that Queen Margaret and other ladies accompanying the army could observe the siege from a safe distance. Efforts were also made to isolate and cut the supply lines of the defenders. The capture of boats belonging to the latter, no doubt used to bring in provisions by the garrison, are recorded as having been captured in a letter sent by the king dated 17 April. By 22 April 1304 Edward’s army was encamped outside of the walls of Stirling Castle. Hostilities were preceded by a messenger being sent to demand the surrender of the garrison. Oliphant replied that he needed to ask for permission from his superior, John de Soules, then in France, before providing a response. Understandably, considering the delay that this exchange of messages would have entailed, this offer was rejected out of hand by Edward. The Flowers of History records that his response was to say ‘By no means; let him consider by himself whether he thinks it better to defend the castle than to surrender it to us’. The English then began the siege by attacking the castle with stone projectiles and other missiles. The huge quantities of ammunition that had been stockpiled meant the attackers could keep up a heavy bombardment. According to the account of the Flowers of History, these projectiles caused major damage to the castle and losses amongst the garrison. Yet the defenders were undaunted by this onslaught and put up a fierce resistance, skilfully hiding their provisions in the caverns under the castle. They frequently sallied forth to attack the camp of the besiegers and used their own artillery and crossbows to great effect. The king was said to have narrowly avoided death on two occasions, one time from a crossbow bolt, which lodged in the saddle of his horse and later from a large rock that was dropped next to him. Other soldiers in the English army were less fortunate, with the Flowers of History claiming that the defenders ‘made a great slaughter in the king’s army’. It was partly for this reason that reinforcements, particularly crossbowmen, were summoned from the garrisons of English occupied castles in southern Scotland. The length of the siege also placed a strain on the ability of the king’s officials to supply the army, with an urgent demand for provisions to be sent from Berwick-upon-Tweed issued on 29 June as ‘they can find nothing in these parts’. This shortage even extended to the royal horses, who needed oats and beans as they had nothing to eat except for grass. Thomas Gray in his chronicle the Scalacronica records one especially vivid episode that took place that involved his own father, also called Thomas. At one point during the siege the latter’s lord, Henry de Beaumont, was caught at the barriers outside the castle by a hook thrown by one of the siege weapons of the defenders. Thomas managed to drag him to safety but was almost immediately afterwards hit in the face by a bolt shot by a torsion powered weapon called a springald (effectively a giant crossbow). He was knocked unconscious by this missile and was believed to have been killed by his comrades. However, remarkably, he managed to regain conscious before he could be buried and later recovered from this injury. Yet despite this heroic resistance the pressure exerted by the besiegers eventually proved to be too much for the defenders. After three months of being besieged their food supplies were depleted and the English bombardment had inflicted significant losses on the garrison, who were by now no doubt psychologically traumatised by being subjected to such heavy missile fire over an extended period. This prompted them to send an offer to surrender on 20 July. Yet, no doubt to the amazement of the defenders, this attempt to yield was at first rebuffed. This was because Edward wanted to showcase a huge new siege weapon that was still under construction. Throughout the siege the king’s craftsmen had been hard at work building a large trebuchet called Warwolf. Once ready it was deployed against the castle and according to the chronicler Langtoft it succeeded in demolishing a whole wall. It was only after the fortress had been ‘struck by Warwolf’ (to quote from a letter written by a participant at the siege), that they were permitted to surrender on 24 July. The Flowers of History states that Edward’s initial reaction was to threaten to hang and disembowel the survivors. He was angered by the long duration of the siege and the determined resistance of the garrison. It was only after he received tearful pleas for mercy from Oliphant and the other defenders that he was persuaded to grant them mercy. They were first made to leave the castle barefoot and with ashes on their heads before throwing themselves on the king’s mercy. Later they were sent to England where they were imprisoned in various castles. The fall of Stirling marked the effective end of Scottish resistance to the English. A short time later Wallace was captured near to Glasgow and was taken southwards to London, where he was brutally executed. Edward’s conquest of Scotland was seemingly complete. Yet, as Outlaw King shows, this victory was to be short-lived. 1 – Photograph of Stirling Castle sourced from Wikipedia, author: Andrew Shiva. Creative Commons Attribution-Share Alike 4.0 International licence. 2 – Statue of Alexander III on the west door of St. Giles Cathedral, Edinburgh sourced from Wikipedia, author: Kim Traynor. Creative Commons Attribution-Share Alike 3.0 Unported licence. 3 – Stained glass window of Margaret, Maid of Norway, at Lerwick Town Hall, sourced from Wikipedia, author: Colin Smith. Creative Commons Attribution-Share Alike 2.0 Generic licence. 4 – Painting of Edward I at Westminster Abbey, sourced from Wikipedia, author: unknown. Identified as being in the Public Domain. 5 – Statue of William Wallace at Aberdeen, sourced from Wikipedia, author: Axis12002. Identified as being in the Public Domain. 6 – A thirteenth century map of Scotland depicting Stirling as an island, from Matthew Paris’s Abbreviated Chronicle, British Library Cotton MS, Claudius D. vi, f.12v. Identified (by Wikipedia) as being in the Public Domain. 7 – Manuscript miniature of the Siege of Jerusalem, British Library, Royal 1 E IX, f. 222. Creative Commons CC0 1.0 Universal Public Domain Dedication. 8 – Photograph of Stirling Castle sourced from Wikipedia, author: Andrew Shiva. Creative Commons Attribution-Share Alike 4.0 International licence. 9 – Fourteenth century Flemish manuscript miniature of a springald from the Romance of Alexander. Bodleian Library, MS. 264. Photo: © Bodleian Libraries, University of Oxford. 10 – Thirteenth century French manuscript miniature of a trebuchet being used during a siege. Morgan Library, MS. M.638, f. 23v. © Morgan Library. 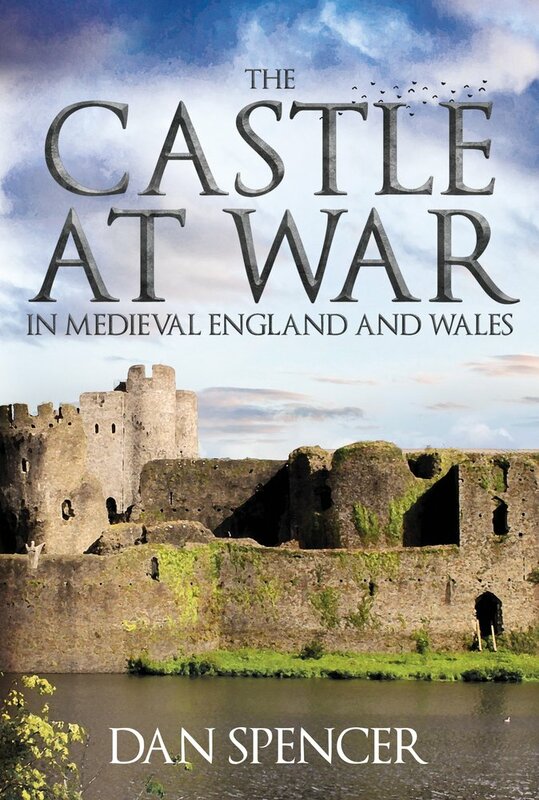 For my account of the siege of Stirling Castle see, Dan Spencer, The Castle at War in Medieval England and Wales (Stroud: Amberley Publishing, 2018), pp. 161-2. Spencer, The Castle at War in Medieval England and Wales, p. 153. Spencer, The Castle at War in Medieval England and Wales, p. 154. Spencer, The Castle at War in Medieval England and Wales, pp. 154-6; Thomas Wright, ed., The Chronicle of Pierre de Langtoft, in French Verse, from the Earliest Period to the Death of King Edward, volume 2 (London: Longmans, Green, Reader, and Dyer, 1868), pp. 264-7. Spencer, The Castle at War in Medieval England and Wales, pp. 157-61. Spencer, The Castle at War in Medieval England and Wales, p. 161; Fiona Watson, ‘Oliphant [Olifard] family’, Oxford Dictionary of National Biography, Oxford University Press, 2004 (http://www.oxforddnb.com/view/10.1093/ref:odnb/9780198614128.001.0001/odnb-9780198614128-e-54301?result=6&rskey=MqNIUy#odnb-9780198614128-e-54301-headword-2), accessed 20 October 20178; C. D. Yonge, ed., The Flowers of History, especially such as relate to the Affairs of Britain. From the Beginning of the World to the Year 1307. Collected by Matthew of Westminster, volume 2 (London: Henry G. Bohn, 1853), p. 571. Spencer, The Castle at War in Medieval England and Wales, pp. 161-2; Joseph Bain, ed., Calendar of Documents Relating to Scotland, Volume 2. A.D. 1272–1307 (Edinburgh: H. M. General Register House, 1884), pp. 391, 419-20; Michael Prestwich, War, Politics and Finance under Edward I (London: Faber and Faber, 1972), pp. 53, 97-8, 147. Spencer, The Castle at War in Medieval England and Wales, p. 162; Bain, Calendar of Documents Relating to Scotland, p. 404; Michael Alexander Haskell, ‘The Scottish Campaign of Edward I, 1303-4’, (unpublished doctoral thesis, Durham University, 1991), pp. 44-5, 103; Yonge, ed., The Flowers of History, pp. 570-2. Spencer, The Castle at War in Medieval England and Wales, p. 162; Bain, Calendar of Documents Relating to Scotland, p. 405; Yonge, The Flowers of History, pp. 573-4; Wright, The Chronicle of Pierre de Langtoft, pp. 357-8. Thank you for posting-I traveled to Scotland 2 years ago and visited Stirling Castle-my maiden name is Bruce & I’m very interested in learning about my family history!